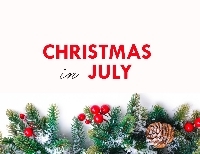 So, in Australia, I've celebrated "Christmas in July" quite a few times, which is why I thought why not share the celebration with fellow swappers! Christmas in July for Aussies, emulates a wintery vibe...so for those in the southern hemisphere, why not have a Christmas during winter? For the rest of the world, you want in on a summery hot Christmas? Then why not receive some Christmas cards during July? For this swap you will have two (2) partners, you will send one (1) Christmas Greeting Card to each of them. Write a little seasonal note to them! Have fun with it! The Christmas Cards can be storebought or handmade (if handmade, no sticker-slapping). The cards are SENDER'S CHOICE. No free/ad/zazzle cards allowed. Newbie friendly! Open to swappers with a rating of 4.89 or higher!